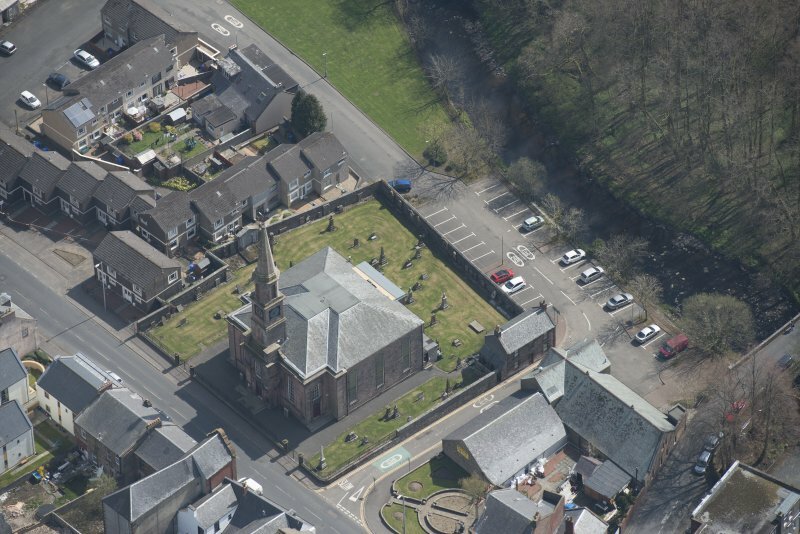 Oblique aerial view of Loudoun Old Parish Church, Newmilns Tower and Newmilns Churchyard, looking ESE. 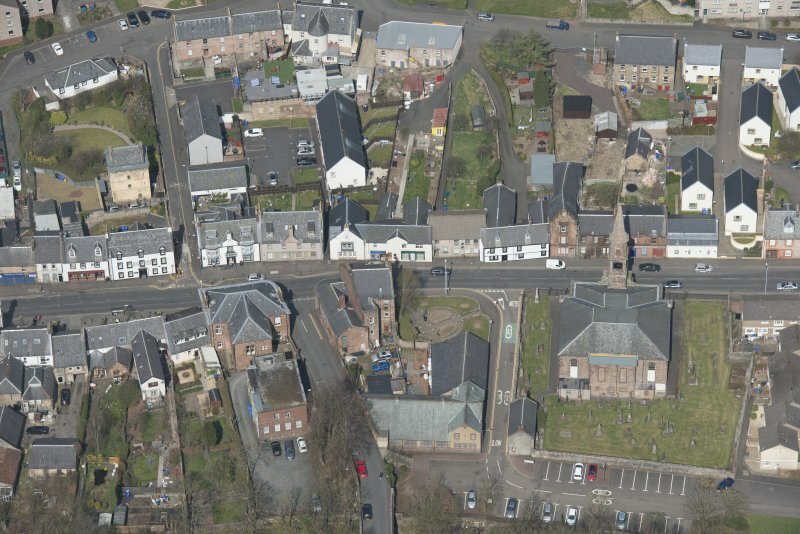 Oblique aerial view of Loudoun Old Parish Church and Newmilns Churchyard, looking ESE. In Newmilns churchyard are the graves of a number of Covenant martyrs: (a) John Morton of Broomhill, a well-known Covenanter, shot dead at the Battle of Drumclog: (b) John Gebbeie of Feoch, wounded at Drumclog and died some time later: (c) John Nisbet of Hardhill, hanged at the Grassmarket, Edinburgh on 4th December, 1685. There is also a modern monument erected in 1829 to the memory of Mathew Paton, David Findley, James Wood, John Nisbet of Glen, and James Nisbet, slain in various places and dates between 1666 and 1684. (Gibson quotes fully the long inscriptions on the various stones). When seen by Thomson, Morton's and Gebbie's tombstones had sunk into the ground so that only part of the inscriptions could be read. The inscription on John Nisbet's stone is modern. Apart from the 1829 memorial tablet, there is another modern obelisk (erected 1913) in the NW corner of the churchyard, dedicated to Matthew Paton, David Finlay, James Wood, John Morton, John Gebbie, Thomas Fleming, John Nisbet Jr and Sr, James Nisbet and John Law. Also, there are individual memorial tablets on the N wall of the church to John Nisbet and John Law. The only headstone seen, on the W side of the churchyard, is that of John Morton. Visited by OS (JRL) 30 July 1982.